Russia is a great choice for explorers looking for an exciting snow trip. Its two main destinations: Caucasus in Eastern Europe and the remote Kamchatka in the north-eastern part of Asia guarantee massive snowfalls of dry powder. Going freeriding in Russia is a one in a lifetime journey that YOU can experience with LUEX at the best possible price on the market. Call our specialized snow travel team to find out more. Russia is where adventure meets culture, where you can ski remote regions and tour some of the world’s most unique historical areas. A ski trip in Russia could be a chance to check out some of the world’s best untracked terrain, to ride the slopes at an up-and-coming resort and home of the Winter Olympics, or to visit Moscow, the capital city of Russia. 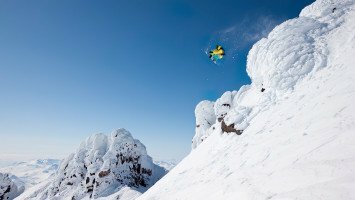 Whether you choose to visit the powder paradise known as Kamchatka for a once-in-a-lifetime chance to ski in the “land of fire and ice,” or if you head to the Caucasus region to heliski or freeski and visit charming Russian villages and bustling cities, you’re sure to find plenty to enjoy in Russia. The terrain of Russia is diverse, spanning from wide open powdery snowfields, to rugged cliffs, steep chutes and perfectly gladed tree skiing. You’ll find a little bit of everything in Russia and plenty to go around. The annual snowfall in Russia ranges from a pretty impressive 10 meters to a whopping 20 meters a year so no matter where you choose to go, you can almost count on great skiing. The strong and stable maritime snowpack in the western regions of Russia means that you’re in for reliable skiing conditions too. home of the 2014 Olympics, Sochi, a small Black Sea Town is sure to be a world class skiing destination in the future, but you can enjoy it now before the crowds arrive. If that’s not enough to make Russia special, how about the incredible Kamchatka region, where you can ski on active volcanoes in one of the world’s snowiest regions and enjoy vertical descents of between 1.000 to 2.000 meters set against the backdrop of the beautiful blue ocean. Kamchatka, commonly called “the land of fire and ice,” is truly an adventurer’s paradise. For skiers that want more than just a ski trip, Russia is a great choice because no matter which region you choose, you’ll experience a new culture and centuries’ old customs. You might choose to visit the charming mountain village Arkhyz or choose a trip that includes a visit to Moscow one of the world’s oldest and most influential cities. LUEX has several Russia ski trips available and as the country becomes more and more popular among skiers you may find an even larger selection in the future. 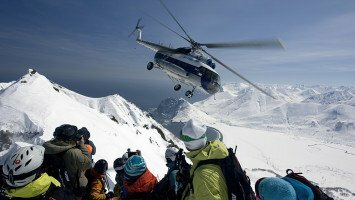 Skiers and snowboarders can choose the Sochi Caucasus Freeski trip or the Heliskiing Caucasus trip, or one of our most popular trips, Heliski Kamchatka. No matter which trip you choose, LUEX’s trips are always with the best ski trip operators in the world, which is important when you’re skiing in the wild and remote landscapes of Russia. 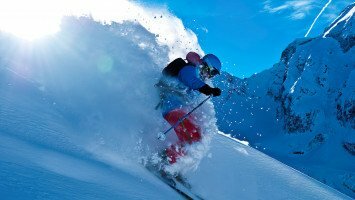 Epic powder, wild terrain and affordable prices? Check, check, check; Russia has got it all. Let LUEX take you on the trip of a lifetime, to the snowy, undiscovered paradises of Russia.